The Icom M330 packs performance into a compact design providing a reliable fixed mount VHF with easy installation even in tight places! Built with a dot-matrix display the M330 includes a bright and easy to read screen. A directional keypad and soft keys offer a simple and smooth operation and most used functions are assigned to soft keys for quick one push function access. With a bright backlight, the M330 buttons are easy visible in any environment. IPX7 waterproof rating and exclusive AquaQuake feature allows durability and functionality in any environment. The Icom M330 is built with Icom’s well known toughness and reliability and outputs a solid 25 watts for clear communication while the new speaker design delivers dynamic and clear sound over a wide bass and treble range allowing you to hear in any environment. Icom’s M330 includes a Dual/tri-watch function and dedicated CH70 receiver which can continuously monitor CH70 even while using another channel. The M330 also comes standard with a weather channel with alerts. 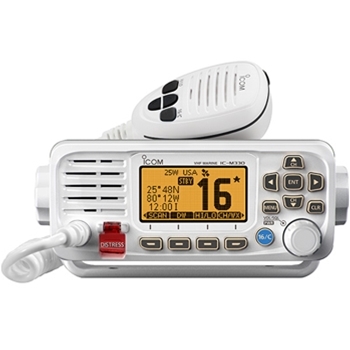 Although this unit does not include an internal GPS, you can pair your M330 with a compatible GPS Chartplotter via NMEA 0183 for DSC calling capability. Available in Black or White the M330 comes packaged with a bracket mount included with optional flush mount kit available as an add-on. 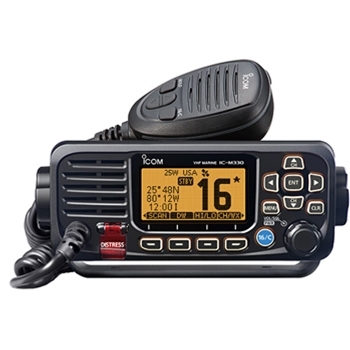 If you’re looking for a user friendly and reliable unit look no further than the Icom M330.